George Graham Reviews Jesse Harris' "The Secret Sun"
It is not often when an artist who had only had a couple of very independent album releases, literally sold out of his apartment, wins a very high profile Grammy Award. 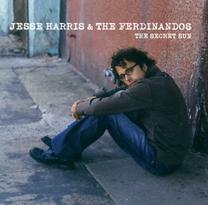 But that is the case for this week's artist, Jesse Harris, who together with his band The Ferdinandos, has just released his first nationally-distributed CD called The Secret Sun. The Grammy Award Jesse Harris won was for writing Norah Jones' hit song Don't Know Why, which won "Song of the Year," along with four other songs on her CD Come Away with Me, which won several other Grammys. Harris also played guitar on much of Ms. Jones' CD as well. But before his encounter with Norah Jones, whom he met on a trip to Texas, where she served as his chauffeur, 33-year-old New York native Harris had a musical career going back to about age 17, when he first started writing songs. Growing up in an artistic family -- his mother was a TV writer and has played a character on a soap-opera since the 1960s -- Harris took classical piano lessons from childhood. He originally wanted to be a writer as well, majoring in English at Cornell. But he also found himself taken by the music of Woodstock-era singer-songwriters like Bob Dylan, Joni Mitchell and Stevie Wonder. That set him on the path of being a composer of music and verse, more than a writer of prose. Eventually he became half of a duo called Once Blue, which had a major-label release in the mid 1990s, but the group's album was lost in the vagaries of changing management at the label. Harris later formed The Ferdinandos, with guitarist Tony Scherr, bassist Tim Lutzel and drummer Kenny Wolleson, naming their group after a favorite Italian restaurant. They did a lot of performing in various clubs around New York, and did three modest low-budget CDs, recorded largely live. Harris and bandmates also did some studio and sideman work. The various members of the Ferdinandos have performed and recorded with Tom Waits, Bill Frisell, John Scofield and the Lounge Lizards. And it was on one of those sideman dates, with Kenny Wolleson going to a gig at the University of North Texas, at Denton, when Harris tagged along. Norah Jones was a freshman there, and happened to be driving the biggest car, and old Cadillac, so she was appointed to drive the band around. She let on that she was a singer, and they played an informal set on a golf course, and thus their musical association began. But Jesse Harris continues to devote most of his attention to the Ferdinandos, whose three independent releases remained largely obscure. Harris himself said that he got used to the idea that the Ferdinandos were something that existed "outside of the music industry." But with the great, and largely unexpected commercial success of Norah Jones, and Harris' prominence as a contributor to the CD, interested in Harris' own music naturally increased among record labels, and Harris ended up signing with the pop side of the jazz label Verve Records, which released The Secret Sun, which Harris had already recorded with intentions of self-release. He followed his usual pattern of recording quickly, with most tracks done live in the studio in one or two takes. Harris has a laid-back light tenor voice that can remind one of Michael Franks or Lee Feldman at times, though Harris' mostly acoustic instrumentation as often implies folk and blues as it does jazz. His songs are often lyrically pithy, sometimes oblique, and usually about some phase of love or the lack thereof. The Ferdinandos are a musically compatible bunch who have obviously played together live quite a bit. The underlying sound is acoustic, with Harris' acoustic guitar, Tim Luntzel playing both acoustic and electric bass, and drummer Kenny Wolleson keeping the laid-back sound. Guitarist Tony Scherr often gets electric, and the band can rock out when they want to, though that is not their strongest suit. The informal sound of the Ferdinandos is quite evident, with a lot of the little bits of "character" and slight imperfections being left in that would usually be polished off a major-label release. The result is an engaging album that gives an airy, vaguely folky-jazzy facet to the singer-songwriter genre. Jesse Harris is an appealing singer-songwriter who brings a generally laid-back, vaguely jazz-influenced style to his largely acoustic music. He is one of those songwriters who manages to say a lot, and to imply a lot, in rather few words. His new fourth CD, The Secret Sun providess a nice cross-section of his stylistic interests, and shows the sympathetic musical interaction among the long-time members of his band the Ferdinandos. The informal sound of the CD also adds to its appeal. Sonically, we'll give the CD about a B. It can sound a bit less-polished than some recordings, though Harris' voice is generally well-recorded. But, and I seem to be saying this every week, there is far too much compression in the mastering process for the largely acoustic music. Everything is the same volume -- loud -- and on the rock tunes, the push for cranking it up to the max makes for some distortion and unpleasant artifacts on the bass and kick drum. Given the state of the music business, everyone knows that if Norah Jones had not had a big hit with Jesse Harris' songs, and Harris himself had not won a composer's Grammy Award, this intelligent acoustic-oriented artists would still be selling his CDs out of his apartment from his website. Fortunately, except for the dumbing-down the sound quality of the CD, which seems to be mandatory among major labels, Harris continues to do what he has been doing, and now can reach much wider audiences.